Have you been looking for a unique way to get together with a group of your favorite people while enjoying creativity and a good glass of wine. 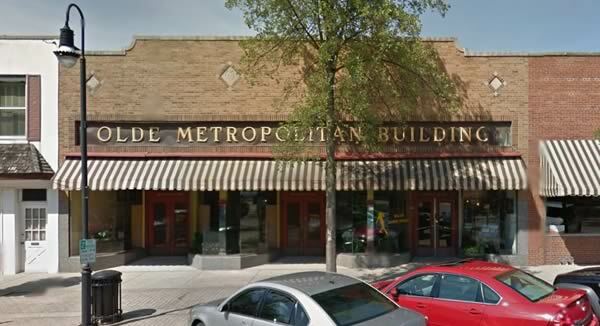 Come see our great studio in the quaint restored Metropolitan Building. Its the perfect environment for your special event. Stroke of Genius is a family run paint and wine studio with talented artists offering wonderful instruction in a comfortable, friendly atmosphere. Studio owner Chris Glatzel has had painting as a passion for over 20 years. Her background in art lies in both oil and acrylic mediums as well as drawing. Chris grew up enjoying art and has taken many art classes over the years. She loves leading wine and painting classes. Her experience includes being an Art Teacher at a private school. Looking forward the studio is going to be offering online art classes, and the opportunity to have an in-home party with online teachers. Located in Historic Downtown Waukesha and serving the metro Milwaukee area, Stroke of Genius is committed to the philosophy that creativity is in the heart of every person and it just needs a little encouragement to come out. "Every child is an artist. The problem is how to remain an artist once he grows up..." ~ Pablo Picasso. We strive to inspire your inner Van Gogh and surprise you with what you can accomplish given a little help. We offer a personalized experience each time you visit with helpful instruction and guidance from our gifted staff. Even if you can’t draw a stick man you can do this, we promise. Our classes are designed for anyone wanting a creative experience, from the beginner to the advanced artist. It's fun for everyone. The only difference between a hard painting and an easy painting is time. Just more of our step by step process. Giving back to the community is an important aspect to what we do here at Stroke of Genius. If you would like to host a charity or fundraising event let us know by contacting us through email at hello@paintwinestudio.com or call 262-893-4186. We consider it an honor to help local charities, Christian organizations and non-profits grow their cause. To learn more about Stroke of Genius or to book wine and painting classes or a special event, contact us via email at hello@paintwinestudio.com or call 262-893-4186. Follow Stroke of Genius on social media to learn about new classes & special offers. Give the gift of a great night out! 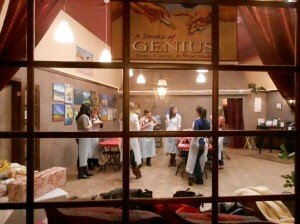 Stroke of Genius Gift Certificates make great gifts. Gift certificates are for $40, which includes a $35 class and a drink. valued at $42. Each Gift Certificate has a unique coupon code that can be used to book any public class online or can be used as partial payment for a private party. After booking you will receive an email with a Adobe pdf gift certificate that can be printed out and given as a gift. Please note: Gift certificates may only be used online using gift certificate code. Gift Certificates expire exactly 1 year from purchase date. They may not be redeemed for cash. Gift certificates are non-refundable. After you complete your order you will be emailed a copy of the gift certificate in Adobe PDF format.